Why Does United Parcel Service Trade at a Premium to FedEx? United Parcel Service, Inc tends to trade on a higher earnings multiple than FedEx Corporation. Here is why. It's always interesting for investors to compare two similar companies in an industry, and United Parcel Service, Inc. (NYSE:UPS) and FedEx Corporation (NYSE:FDX) make up one of the most instantly recognizable pairs in the investment world. With that said, the market has traditionally given UPS a valuation premium on FedEx. Let's take a look at why this is so, what it says about the companies, and whether the premium could and should change in future. 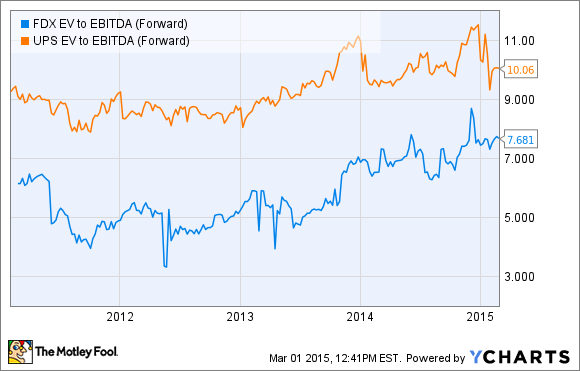 FDX EV to EBITDA (Forward) data by YCharts. Readers will note I've used enterprise value (market cap plus net debt), or EV, over earnings before interest, tax, and depreciation, or EBITDA, which is because this metric includes a consideration of debt levels. The chart clearly shows the notable premium that UPS still has on FedEx. However, if you look at a less conventional measure like EV over free cash flow, or FCF, a different picture emerges. On this basis, FedEx is actually valued higher than UPS. 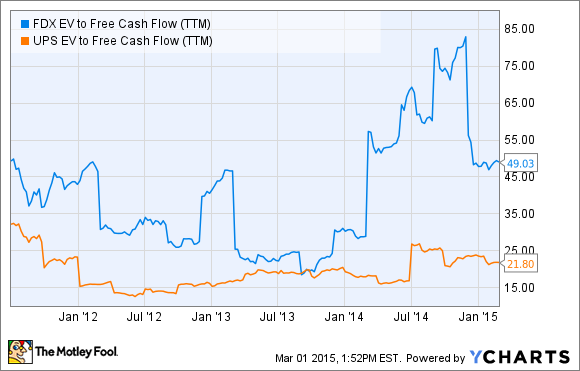 FDX EV to Free Cash Flow (TTM) data by YCharts. Free cash flow is important to investors because it represents the money that an owner can actually pull out of a company, and when we look at free cash flow-based valuations (second chart) the valuation premium disappears. Herein lies one answer to the question posed earlier. Simply put, UPS has traditionally been a much better converter of sales and earnings into FCF. Therefore, the market is willing to pay a premium for UPS earnings, because they tend to be converted into FCF at a higher rate than FedEx has converted in the past. A look at historical FCF conversion from net income demonstrates this point well. A figure of 1 represents 100% conversion of net income into free cash flow. There are a few outlying data points on the chart, but the pattern is clear. If FCF is the key to understanding how the market might value these stocks, then what are the challenges and opportunities for both companies going forward? For UPS, the main challenge will be to get the company's long-term plans back on track. In a previous article I outlined management's plans for 2015-2019, which, at the time they were given, included 8%-11% operating profit growth and capital expenditures of 4.5%-5% of revenues. As you can see in the following chart, UPS has spent relatively less than FedEx has on capital expenditures in the last decade -- partly the reason for its better FCF conversion. However, the real issue for UPS is dealing with e-commerce-fueled peak demand during the holiday season. UPS has disappointed the market for the last two years on the issue. Failing to deal with peak demand has cost the company, and guidance has been reduced. Indeed, as the linked article outlines, management's adjusted EPS forecast for 2015 is exactly the same as it forecast for 2014, at the start of last year. It's one thing to have excellent conversion rates, but UPS also needs to grow the income to ultimately convert into FCF, and it also needs to avoid increasing capital expenditures outside of its plan. Turning to FedEx, there is good reason to believe that its FCF and FCF conversion could increase notably in future years. The company has a profit improvement plan in progress, which is intended to increase profitability by $1.6 billion by 2016. Consequently, analysts forecast FedEx to grow EPS to $10.98 in the full year to May 2016, from $6.75 in May 2014. Additionally, you need to appreciate that FedEx is going through a period of investment in modernizing its aircraft fleet and expanding its sort facility. For example, in the last three years, FedEx capital expenditures have been around 1.6 times its depreciation rates, compared to around 1.2 times for UPS. Moreover, turning to last year's 10-K filing, management outlined its plan to increase capital expenditures by 19% to $4.2 billion in 2015. However, $1.68 billion is earmarked for growth initiatives with $2.52 billion for maintenance. Based on the latter figure, and analysts' forecasts for $47.8 billion in revenue, then an estimate for FedEx's maintenance capital expenditure requirements is around 5.3% of revenue -- it's good, but not quite at the 4.5%-5% level that UPS forecasts for its overall capital expenditures to revenues from 2015 to 2018. Will the valuation premium close? The valuation premium that UPS has over FedEx in terms of earnings is justified due to the greater FCF conversion rate of the former. According to the first chart above, on an EV/EBITDA basis, UPS has a 31% valuation premium to FedEx. In order to close this gap, FedEx will need to convert net income into FCF (third chart above) at a rate closer to its rival. Until then, the valuation premium -- in terms of EV/EBITDA and P/E -- commanded by UPS is justified. I will return to the subject of FedEx's cash flow generation in a future article.